The Shai-Hulud begin their life as microscopic larvae, called Sand Plankton, which eventually grow to the stage of Sandtrout (or Little Makers, as labeled by the Fremen) — “flat and leathery” creatures, with no recognizable features besides their external ciliae. Their purpose is to block water in fertile pockets underground, in order to create a safe habitat outside for the bigger worms. It is in this stage that the creatures excrete a substance that, combined with water, produces pre-spice mass — which, in turn, transforms into spice when it surfaces. The Sandtrout enter hibernation and eventually reach the “stunted worm” stage (about nine meters in length), only to become the fully-grown Shai-Hulud, which can grow over 400 meters of length for 40 meters of diameter. The worm Paul Atreides summons, however, “appeared to be around half a league” in length, indicating that the creatures can reach much bigger sizes. 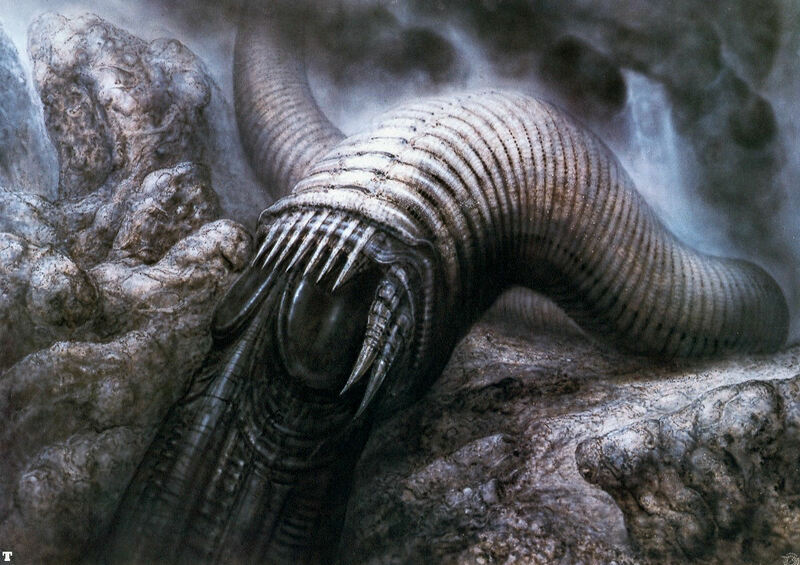 An initial attempt at designing the Sandworms for a film was done by Hans Ruedi Giger, for Alejandro Jodorowsky’s Dune. Giger’s design bore the artist’s trademark biomechanical textures and sexual overtones. When Jodorowsky’s Dune was abandoned, so was Giger’s Sandworm — never to be presented onscreen. 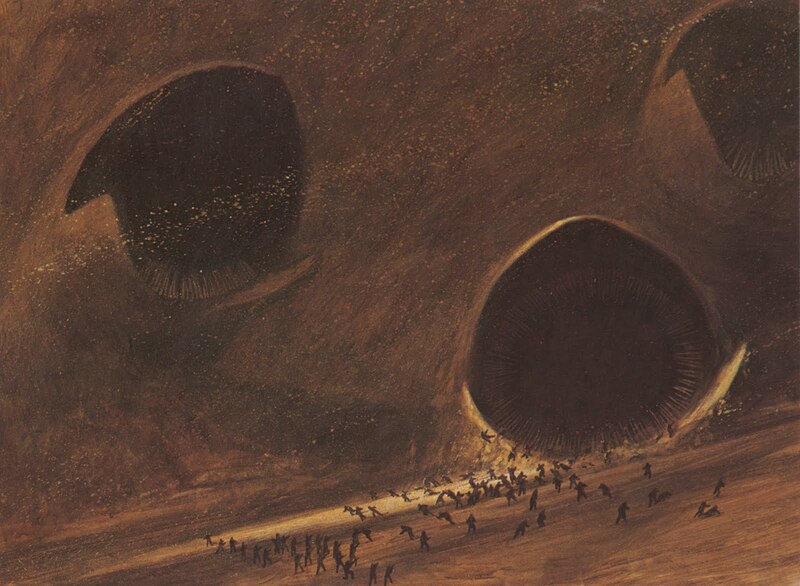 One of Schoenherr’s illustrations of the Sandworms. 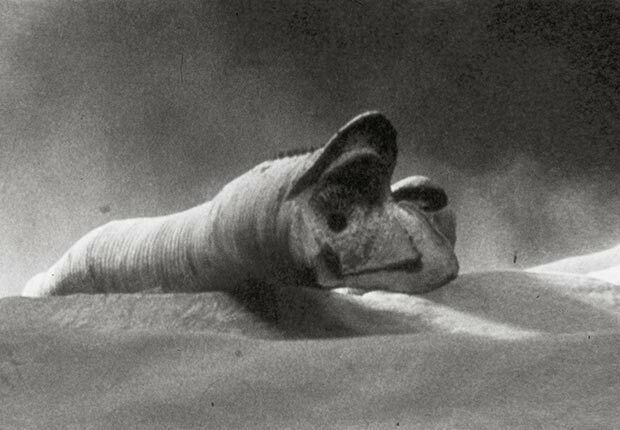 Masters’ earliest concepts for the Sandworms were considerably similar to John Schoenherr’s illustrations for the novel series — in particular, they sported a three-lobed mouth. A considerable number of iterations was considered. “The worms went through a lot of changes,” Miller recalled, “mostly having to do with varying their degree of obsceneness. After all, we were all more than well aware of the fact that we were dealing with the greatest phallic symbols in the universe, and that we would have to be very careful about our worm designs and the camera angles we would use to shoot them. Eventually, though, the worms came around full circle, right back to the drawings Tony had done that looked like Schoenherr’s. And I was happy, I liked that three-lobed mouth and argued for it a long time.” The three-lobed mouth also served the purpose of making the worms appear always upright, even when they ‘rotated’. 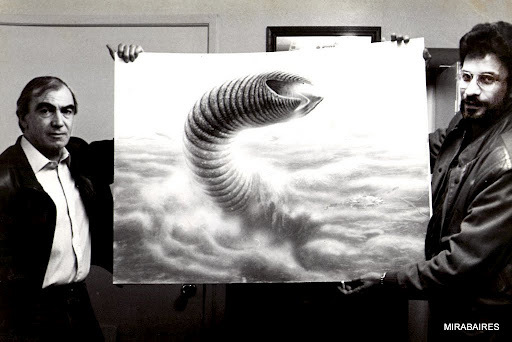 Carlo Rambaldi and Eugenio Zanetti pose with one of Rambaldi’s concepts for the Sandworm. Veteran Italian Monster Maker Carlo Rambaldi and his crew were hired to bring the colossal Worms of Arrakis to the screen. 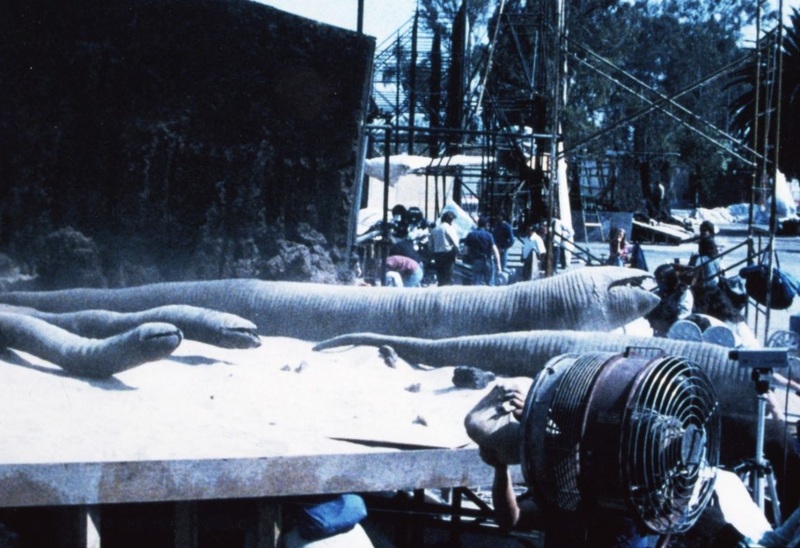 Given the actual importance of the creatures in the film, and the fact that they should be absolutely convincing onscreen, they were given top priority among the creature effects of the film — with over 24 machinists, moldmakers and sculptors working on this task. Rambaldi actually added to the worm design the inner mouth, with three lobes corresponding to the external lobes — filled with crystalline, needle-shaped teeth. This innovation was not only judged to be visually dramatic — but was also designed for a biological purpose: with the inner lips, the worms could avoid accidental ingestion of the sand they move around in. The miniature Sandworms in action. A total of 15 full miniature Sandworms were built in various scales, depending on their purpose in specific shots. The worms were first sculpted in clay, moulded in plaster, packed in polyfoam and covered in latex rubber skin. Two models were fully articulated — with mechanized outer and inner mouths — and measured 22 feet of length for three feet of diameter. 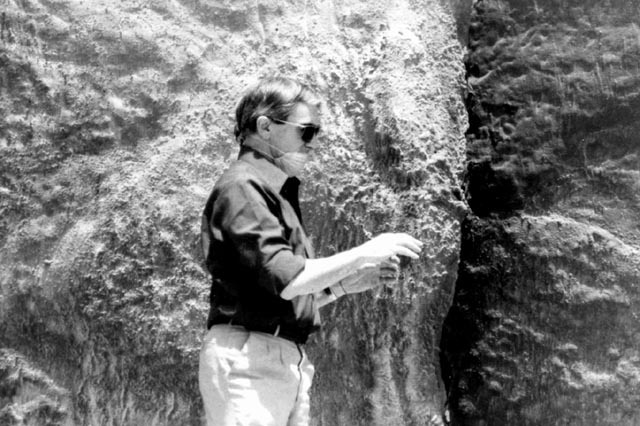 Those were used throughout shooting for sequences that required detailed foreground action (for example when Paul and Jessica hide in a rock formation and are attacked). Three worms were instead built in a smaller size — 15 feet of length for two of diameter — and could only move their body. One of those worms — mounted on the end of a rod — also served to portray a Sandworm diving in the sand. The articulated worms were controlled by inner mechanisms designed by Rambaldi and his principal machinist, Steve Townsend. They allowed a wide range of cable-controlled movements. 10 stunt worms — nicknamed ‘sausage worms’ by the crew — were also built, devoid of any articulation and guided with tracks buried in the miniature desert sets, and simply pulled with cables. 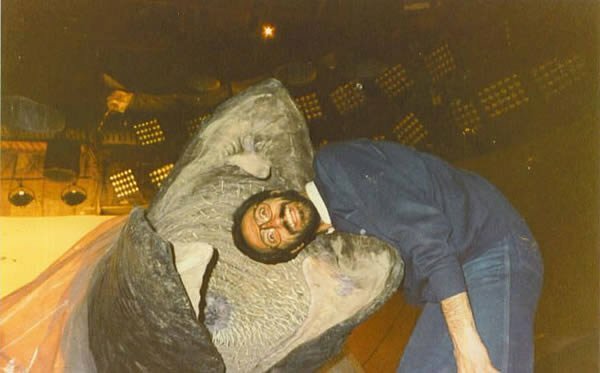 Bruno Landis goofs around with the close-up Sandworm head. 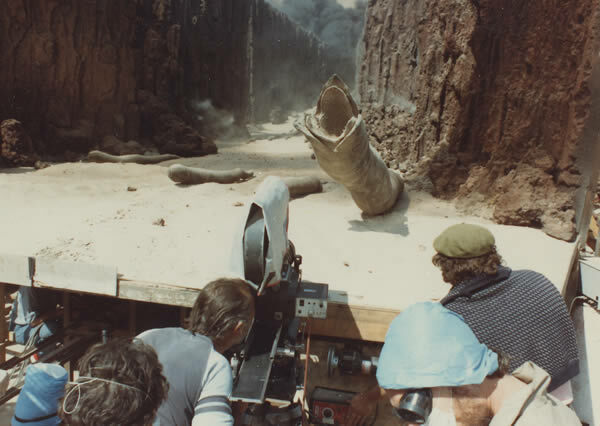 For close-ups of the Shai-Hulud, two worm sections were constructed. The main close-up head and neck section was 12 feet long for five feet of diameter. “[It] was so big it could easily swallow a human head,” Rambaldi recalled. “In fact, that’s mainly what we used this section for — swallowing. 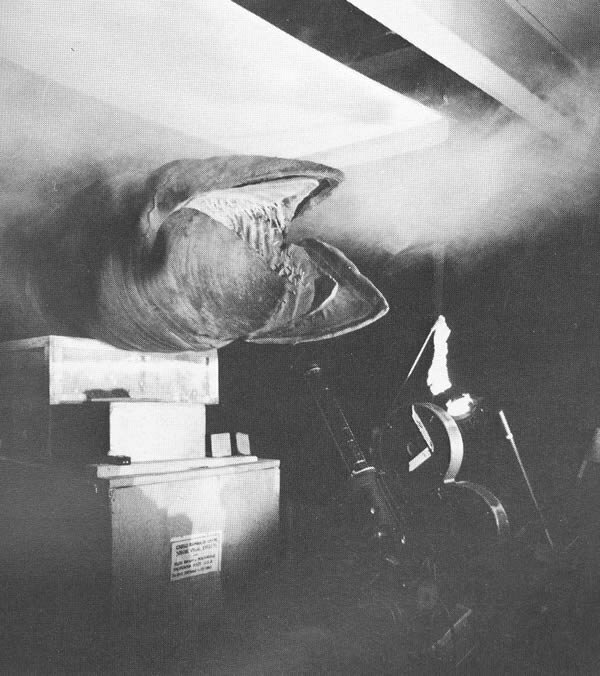 It had a heavily detailed outer mouth and an inner mouth lined with teeth, and we used it for many closeups — like swallowing the harvester, the camera, and the Sardaukar army at the end of the picture.” The other model was a tail section, measuring 20 feet of length for three feet of diameter. Accompanying the Sandworms were their riders — obviously built in scale as rubber miniatures of three different sizes. The most detailed were given maker hooks and lines, although the majority was simply humanoid in shape. 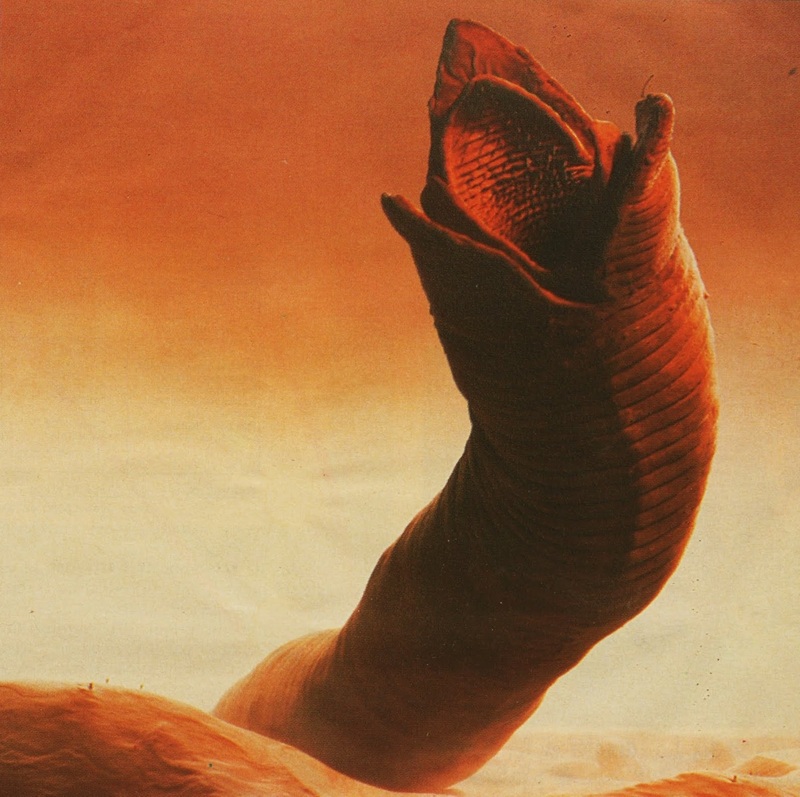 The only full-size worm built for the film was featured in a deleted scene of the film: it was a ‘stunted’ worm, in a scene where it is drowned by the Fremen to obtain “the water of life.” The fully articulated worm featured a more varied color scheme indicating its younger age. The sequences involving the worms — a total of 125 shots — were mostly filmed indoors on a massive ‘worm set’ constructed on Churubusco’s Stage 4. Semicircle-shaped and filled with “five truckloads of sand,” it was 100 feet wide, 60 feet deep and built over platforms five feet off the floor; it was also built in sections that could be detached and reassembled, depending on what specific shots requested. Behind the tabletop a thirty-foot tall sky cyclorama, painted by Ted Mitchell (and repainted about four times), was positioned. In certain shots, such as those from the final battle, additional optically-introduced dust, as well as lightning (provided by the Van der Veer animation department), was added. Puppeteering the Shai-Hulud was a task assigned to Rambaldi and a crew of 60 ‘worm handlers’ — all hired locally in Mexico city; their only prerequisite was that they should be able to speak either English or Italian. The tracks on which the worms were mounted were shaped like sine waves, to give the worms “their desired wiggling motion.” Rambaldi recalled the puppeteering process: “to operate three different worms at the same time, it took nine people at the worm controls. But to operate the largest worms, it took 18 people. Most of the worms were connected on the bottoms of their bodies to three or four different points on the tracks. When we first started to film the worms, security was very tight and people had to wear ID badges just to get on the stage. Even so, things could get crowded in there. Both Brian Smithies and Barry Nolan had a crew of 35 people, and my crew was on stage all the time. But things were funny, too. There were a lot of signs around, painted in Spanish, that said ‘don’t step there!’ or ‘no photos!’ And one of Nolan’s people made this big hand fan out of white cloth to wave Kit West’s smoke around — the kind of fan you see slaves waving over the pharaoh in movies. But this one had ‘Eat at Joe’s’ painted on it!” The ‘smoke’ was a mixture obtained by West to accomplish the black smoke requested by Lynch and moved on set with a wind machine. Filming the close-up worm head. One of the bigger worms is prepared for filming. Set-up for the scene of the attack on the spice harvester. One of the most important sequences was the iconic Sandworm riding test. 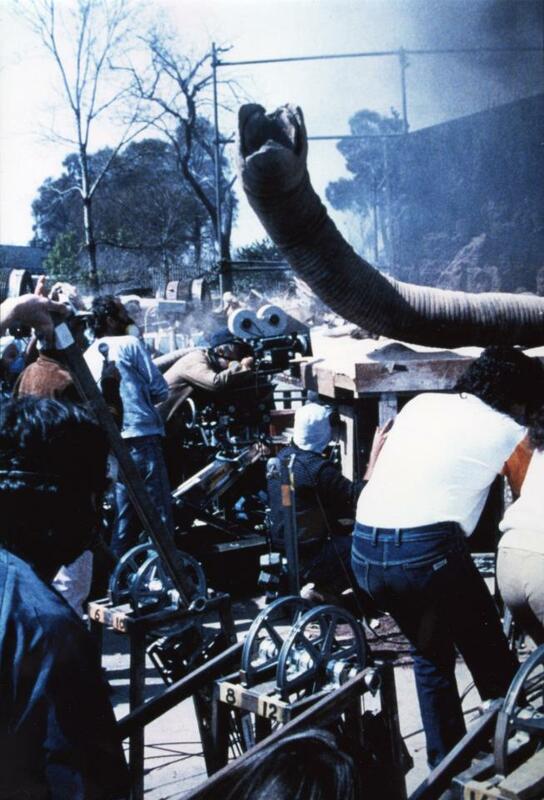 “I knew the worm ride was one of the little hearts of the book,” Lynch said, “and I knew we’d better come up with something good for the film, or we’d be in big trouble.” Shots of live action were combined with one of the large worm models, as well as the close-up head, filmed at 240 frames per second in the worm set. 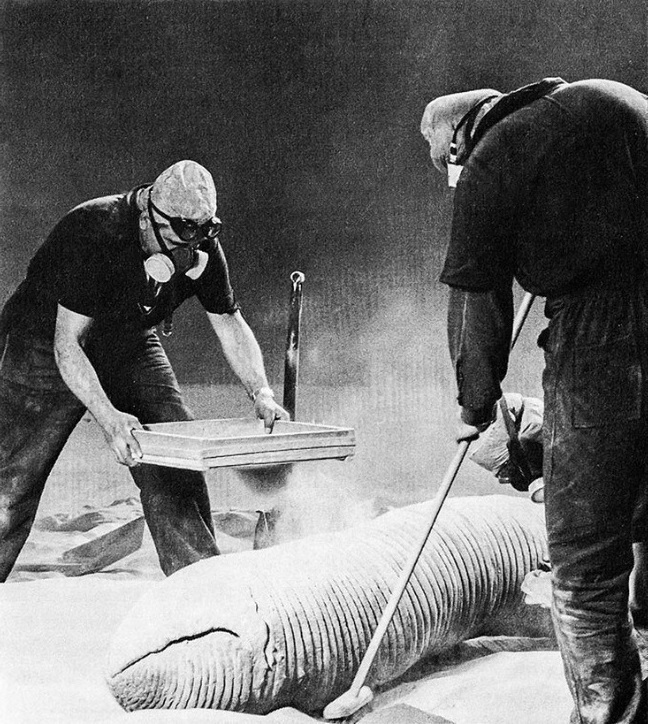 The final shot, with the Sandworm roaring, was a composite featuring the close-up head, a bluescreen foreground shot of Kyle MacLachan, and one of the large worm models in the background. 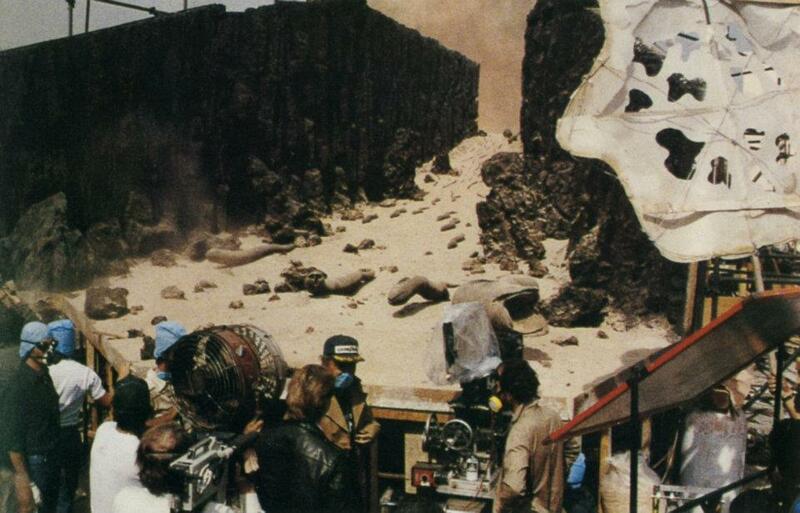 A similar set-up was used in another shot, with more Fremen added. Carlo Rambaldi works on the life-size worm section. For more images of the Sandworms, visit the Monster Gallery. Posted on 28/04/2014, in Movie Monsters and tagged Carlo Rambaldi, Dune, Sandworm. Bookmark the permalink. 2 Comments. Alla mostra dedicata a Rambaldi che vidi da piccolo a Cinecittà c’erano proprio un paio di modelli di questi “vermoni”.Bellissimo quel concept fatto da Rambaldi…. Dune, the movie where the villains never stood a chance.